22 Live Interviews added to website! This article is an excerpt from Chapter five in my new book The Chicken Little Agenda – Debunking Experts’ Lies. You can find out more about the book here, and can order the book from this link. This is the fifth of five parts for Chapter five that will be presented here sequentially. This article is an excerpt from Chapter five in my new book The Chicken Little Agenda – Debunking Experts’ Lies. You can find out more about the book here, and can order the book from this link. This is the fourth of five parts for Chapter five that will be presented here sequentially. This article is an excerpt from Chapter five in my new book The Chicken Little Agenda – Debunking Experts’ Lies. You can find out more about the book here, and can order the book from this link. This is the third of five parts for Chapter five that will be presented here sequentially. This article is an excerpt from Chapter five in my new book The Chicken Little Agenda – Debunking Experts’ Lies. You can find out more about the book here, and can order the book from this link. This is the second of five parts for Chapter five that will be presented here sequentially. This article is an excerpt from Chapter five in my new book The Chicken Little Agenda – Debunking Experts’ Lies. You can find out more about the book here, and can order the book from this link. This is the first of five parts for Chapter five that will be presented here sequentially. 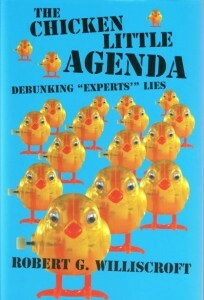 This article is an excerpt from Chapter four in my new book The Chicken Little Agenda – Debunking Experts’ Lies. You can find out more about the book here, and can order the book from this link. This is the eighth of eight parts for Chapter four that will be presented here sequentially. This article is an excerpt from Chapter four in my new book The Chicken Little Agenda – Debunking Experts’ Lies. You can find out more about the book here, and can order the book from this link. This is the seventh of eight parts for Chapter four that will be presented here sequentially.